Like a classic car, sometimes stock just isn’t good enough. When you love the classic curves but need more horsepower under the hood, that’s where the Psyclone Hot set comes in. 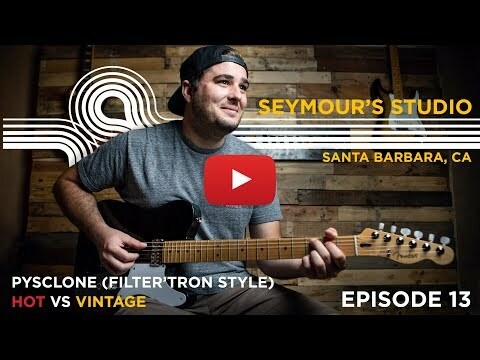 The Seymour Duncan Psyclone Hot set takes the distinctive sound of the original Filter’Tron pickups and supercharges it. Punchy mid-range, tight low-end, and smooth treble combine with the higher output to deliver a pickup perfect for rock, new wave, punk, and psychobilly. Originally designed in our Custom Shop, we took special care when sourcing materials to ensure the look and fit of the pickups are perfect – whether you’re hot-rodding a vintage guitar, or dropping them in a modern classic. The Psyclone Hot pickup set is a drop in replacements for any guitar routed for Filter’Tron style pickups, and includes the correct hardware for either direct mount or pickup-ring mounting options. The neck pickup features a lower output wind that retains clarity and balances the output, while the bridge pickup is hotter and punchier. Seymour Duncan offers our 21 Day Real World Exchange Policy on all new pickups purchased in the U.S. and some other participating countries, which states the following: If for any reason you're not satisfied with the pickup's sound or construction, return it and your receipt to your dealer, or direct to the factory within 21 days for exchange with another pickups of equal or lesser value. To do this, please just send us an email and include your invoice number and the new pickup you'd like to exchange towards.